Congregation Kol Halev (“Voice of the Heart”) is an independent, progressive synagogue community that draws on varied traditions of Judaism in supporting our members, individually and collectively, as we practice and learn about Judaism, while living contemporary and meaningful lives. Originally founded in 1996, we freely adapt aspects of Reform, Reconstructionist, Renewal, and other approaches to Jewish life to fashion a unique and meaningful communal experience for all who participate. Our members integrate various practices that are found in the most successful and engaging spiritual communities within the progressive Jewish world. Kol Halev is a community of leaders. Some of our members hold positions on our board of directors and various standing and ad hoc committees, some lead prayer and play in our band, some teach, and many host events in the larger community and in their homes. All who wish to participate in active leadership are welcomed. Prayer at Kol Halev is participatory, accessible and inclusive. Our Shabbat (Sabbath) Services are largely music based. Prayer with us is a community-building, mind-expanding adventure in a relaxed and spiritually centered environment. We support each other by teaching our songs and using prayer books with English translations and Hebrew transliteration so everyone can join in as they choose. 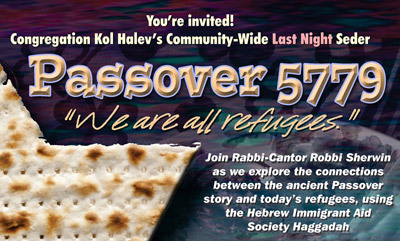 Kol Halev is as diverse generationally as it is in the individual history of each of our members. We pay attention to the lives of our seniors, empty nesters, singles, multi-generational families, young adults, teens and youth with an intention to build community while serving individual needs and desires. Kol HaLev’s activities are designed by the interests of those who attend, with an open welcome to those looking for new ways to connect to Judaism and to each other. We nurture and encourage all who wish to infuse their lives with music, learning, prayer, and worthy deeds. While we come with varied traditions, practices, and beliefs, we are united in providing communal prayer, lifelong learning, and life-cycle events within a Jewish context. To this end, we celebrate the evolving nature of Judaism, constantly finding ways to keep current, relevant, and inspiring. Experience a year with us. In addition to our lively Shabbat services, we offer many opportunities to truly live life in a Jewish context. We celebrate Holidays throughout the Jewish calendar year, hold monthly tisches (potluck Friday night dinners in members’ homes), and host other learning opportunities to further engage us in discussion and build community. And, all of this leads us to participate in deeds of kindness and justice, doing our part in making the world a better place for generations to come. Congregation Kol Halev, grounded in our diverse and inspiring traditions, branches upward and outward with our modern commitments and principles to yield a flourishing and meaningful Tree of Life. Come bask in our shade and delight in our fruits!